Learn the science behind high pressure sodium lighting, and its most common applications in outdoor and commercial lighting. This article identifies where you may want to most effectively use high pressure sodium lighting. High pressure sodium lighting, most often used in commercial and outdoor applications, is recognized for the yellow light it provides. High pressure sodium lights are similar in operation to mercury vapor lights, except there is sodium together with the mercury. 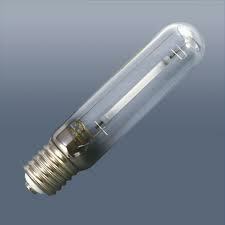 Sodium at high temperatures attacks glass, so the bulb envelope is made instead from a whitish translucent ceramic. Sodium at high pressures behaves differently than mercury, and produces a more even color. It is still strongly yellow, but renders other colors well. It has an efficiency of about 100 LPW. HPS has seen applications similar to mercury vapor lights. This entry was posted in Home Lighting and tagged commercial lighting, high pressure sodium, HPS, lighting, outdoor lighting. Bookmark the permalink.